- Move it or Lose it! 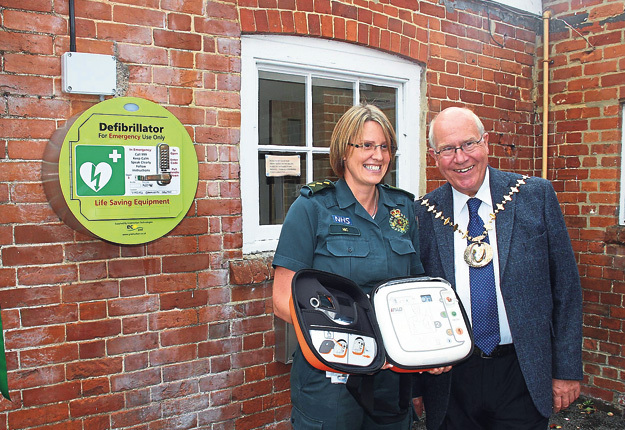 Thanks to fundraising and donations from local people, Viables Community Centre are pleased to host an Automated External Defibrilator (AED), one of the first available at community centres in North Hampshire. South Central Ambulance Service NHS Foundation Trust (SCAS) was able to oversee the purchase of the AED which will electronically shock those having a cardiac arrest before ambulance crews arrive. The device, should it be needed, can be found outside the main entrance to the community centre. In situations where a cardiac arrest is witnessed and an AED is immediately available, survival rates as high as 70% have been reported. With the high usage of Viables Community Centre and the large number of people living very locally it was decided that the ability to use one of these devices, should the need arise, would be very beneficial. Nic Morecroft, Lead Responder Manager for SCAS, said: “We’re really pleased to have assisted in the purchase of a Public Access Defibrillator into one of the first community centres in North Hampshire. We know that public access defibrillators, combined with prompt and effective bystander CPR, can help people who are having a cardiac arrest in the first few crucial minutes before an ambulance crew arrives." To find out more about the AED please go to www.southcentralambulance.nhs.uk or read about the new smartphone app that allows location of an AED at this link. Remember, the first thing to do in any real emergency is to ring 999. Please watch this video from the London Ambulance Service about using an AED. Why not join us on Facebook for all the latest news and events? Just click here to go to our Facebook page. Our updated Privacy Statement is available here. Viables Community Association are now on Twitter! Just click on the Twitter logo below to follow us and keep in touch. We are always looking for new volunteers at Viables Community Centre. Click here for current opportunities. Contact the office on 01256 473634 for more information. Website: www.viables.org.uk/ • Email: office@viables.org.uk • Telephone: 01256 473634.